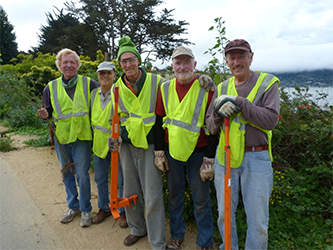 In 2013 the Beautify Tiburon Boulevard Committee and Peninsula Pride merged to form the Tiburon Peninsula GreenTeam. In addition to beautifying the Tiburon Boulevard medians they work with Tiburon Public Works to keep the Old Rail Trail, Blackie’s Pasture, Downtown, Ferry and Fountain Plaza, the Heritage Palm, the Sam Chapman historical planter and Shoreline Park green and flourishing. Their Goal: To enhance pride in the community, increase the attractiveness of public areas and foster fitness through beautification. What They do is install new plants and maintain the medians and public landscapes from Highway 101 to the Railroad Museum.